Few senior management teams would seriously consider making decisions about the use of financial instruments without first developing careful estimates of their effects on revenue and expenses. In most enterprises, there is an impressive array of tools, historical data, and skilled financial professionals to support those who devise or specify financial instruments for use in financing the enterprise. Yet few organizations invest at similar levels to support those who make estimates of the MICs involved in undertaking engineering efforts. A similar deficit of resources affects those who make estimates of the effects on revenue due to carrying technical debt. 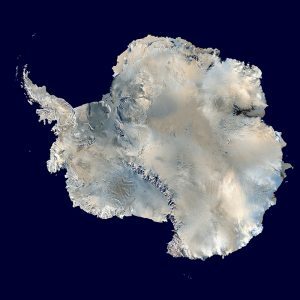 A composite satellite view of Antarctica. Composite by Dave Pape using NASA’s Blue Marble data set. Exploring unknown territory, as Amundsen did in 1911-12, is far more difficult and far riskier than exploring mapped territory. For this same reason, managing technical debt is likely to be more successful when we have even minimal capability for estimating the MICs associated with carrying or retiring technical debt. Courtesy Wikimedia Commons. This resource shortage has starkly negative effects, because of the inherent difficulties associated with projecting the effects of both carrying and retiring technical debt. Although there can be a cost associated with carrying technical debt—I call them MICs—the cost can fluctuate dramatically depending on a range of factors, such as the kind of work underway on the asset that carries the debt; how customers are affected and what they’re doing at any given time; the difficulty of researching engineering problems arising from the debt; loss of revenue due to debt-related delays in reaching the market; loss of sales due to semi-catastrophic failures in customer demonstrations; and much more. In short, the MICs are often unpredictable [Allman 2012]. Moreover, most of the research into the effects of carrying or retiring technical debt has focused on engineering activity, and specifically, software engineering activity [MacCormack 2016][Kamei 2016]. Effects on other activities—marketing, sales, regulatory compliance, to name a few—are, by comparison, largely unstudied. And in many cases, the effects on these other activities are the most significant. Consider first the effect of technical debt on enterprise expenses. The kind of maintenance and enhancement work performed on a set of assets bearing technical debt can determine the extent to which productivity is depressed, in turn affecting the MICs. In many cases, projecting future MICs associated with any given class of technical debt can be difficult because we might not know with sufficient certainty what projects will be undertaken in the intermediate term or long term future, and what kind of work those projects will undertake. Even when we do know these things, the level of involvement with instances of particular classes of technical debt can be difficult to project with a degree of certainty consistent with most other estimates. Turning to revenue, for most organizations, the picture is also bleak. Because some classes of technical debt cannot be retired incrementally, attempts to retire them can have significant impact on operations and revenue. Research in this area is even more limited than in the area of effects on productivity. Projecting MICs with useful accuracy would be a valuable capability. Making MICs more predictable would require systematically gathering data and building expertise for projecting MICs for your enterprise. That problem is more tractable than the more general problem of projecting MICs absent specific knowledge of enterprise characteristics. An enterprise-specific MICs projection capability could elevate the quality of decisions regarding resource allocation for projects of all kinds, including technical debt retirement projects. Policymakers can play an important advocacy role in establishing such a capability. [Kamei 2016] Yasutaka Kamei, Everton Maldonado, Emad Shihab, and Naoyasu Ubayashi. “Using Analytics to Quantify the Interest of Self-Admitted Technical Debt,” 1st International Workshop on Technical Debt Analytics (TDA 2016) , 68-71. [MacCormack 2016] Alan MacCormack and Daniel J. Sturtevant. “Technical debt and system architecture: The impact of coupling on defect-related activity,” The Journal of Systems and Software 120, 170–182, 2016. Available: here; Retrieved: November 19, 2017. The Principal Principle is that a focus on the metaphorical principal of a technical debt can be your undoing. Focus on the metaphorical interest charges. Drive them to Zero and keep them there. Misunderstandings about the metaphorical interest charges on technical debt are costly. They prevent us from exploiting the properties of technical debt that reduce carrying costs and retirement costs. And the misunderstandings arise from the fact that the technical debt metaphor is only a metaphor—technical debt and financial debt are different. The metaphorical interest charges (MICs) and metaphorical principal (MPrin) of a particular class of technical debt can change as a result of retiring other seemingly unrelated classes of technical debt. In most cases, engineering expertise is required to determine technical debt retirement strategies that can exploit this property of technical debt. Unlike financial debt, for technical debt there are no legally required reports or disclosures. We can sometimes estimate MICs, but most organizations don’t track the data necessary to estimate MICs with useful precision. Indeed, developing useful estimates is often technically impossible. Rescheduling interest payments on financial debt is possible only by prearrangement or in bankruptcy, but MICs on technical debt can often be rescheduled by rescheduling work that might incur them. This is useful when we plan to retire assets bearing technical debt, because their technical debt vanishes. The common understanding of interest on financial debts doesn’t correspond to the reality of technology-based systems, which are the targets of the technical debt metaphor. Formulating sound technical debt policy depends on understanding the nature of the difference between interest on financial debt and the metaphorical interest charges associated with technical debt.